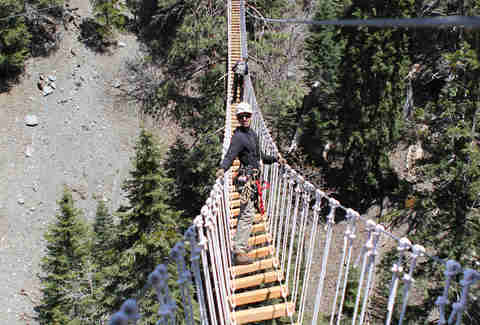 Clawing up to "artfully crafted" arbol platforms and faux-flying across 10 zip lines ranging from 200-1500ft, which is, like...wait, carry the two... thirty miles, or something! 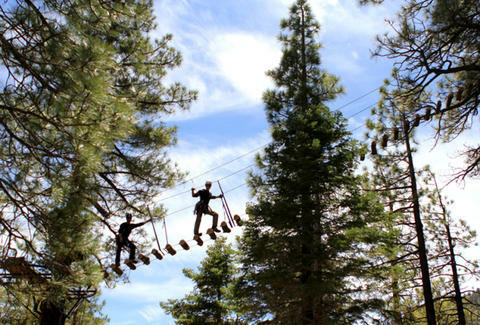 Battling your fear of heights, while taking in the scenery from up to 300ft off the ground with views of the Mojave and the San Bernardino Mountains. 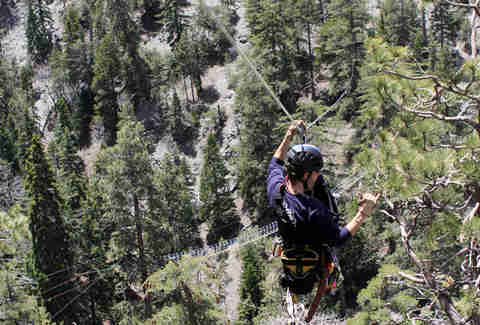 Placing your life in the hands of fate/ rope tensile strength while rappelling at three different locations, or just make like Danson and Highsmith and aim for the bushes. Crossing four Temple of Doom-esque suspended wood-plank bridges presumably while a bald, heart-thieving Thuggee priest yells "Kali Ma" at you. Before the excitement boils over, there're a few requirements for would-be soarers, like the ability to weigh in between 90-250lbs (sorry Christian Bale in The Machinist), walk a mile, and employ enough strength to pull oneself along the cable/ slow down using a glove to create friction, which you can also generate by telling Shaun you think Peetu Piiroinen gets way more air.